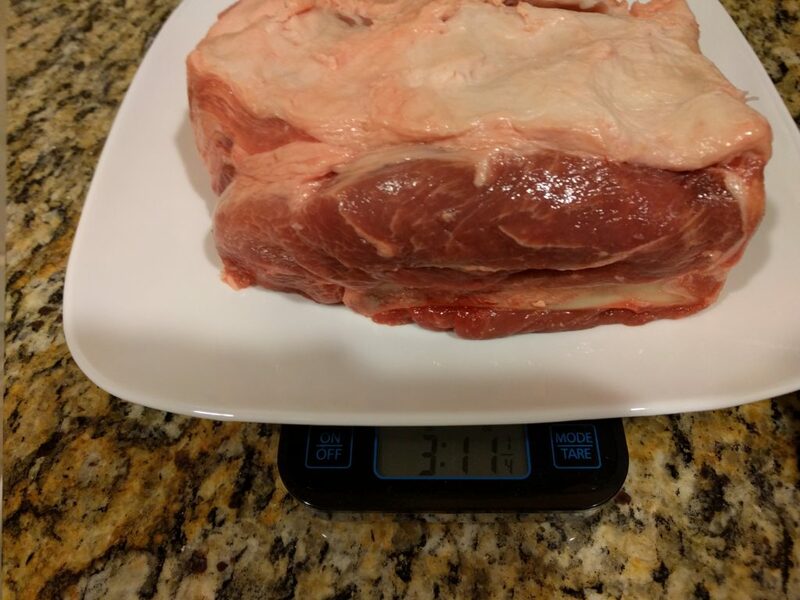 This past winter I smoked a pork shoulder for the first time. 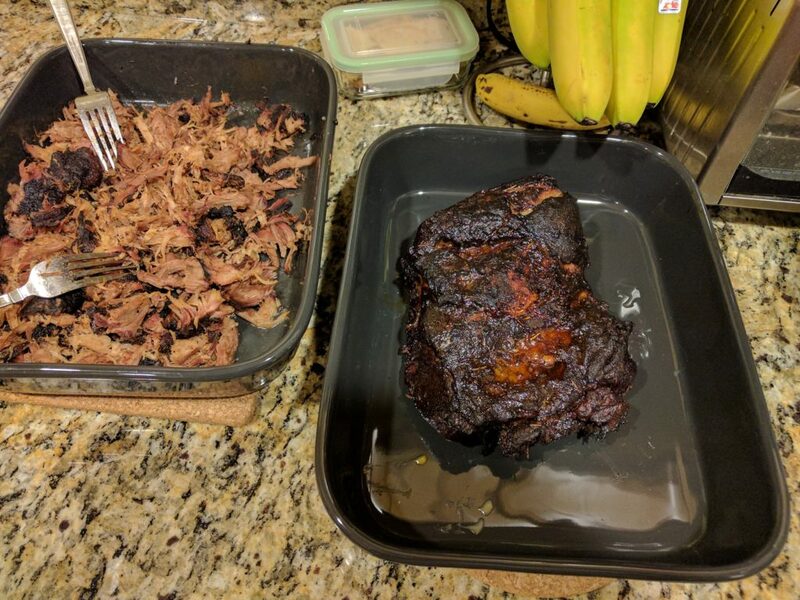 I learned some lessons, continued to work on getting better with my kettle, and decided it was time for pulled pork again. 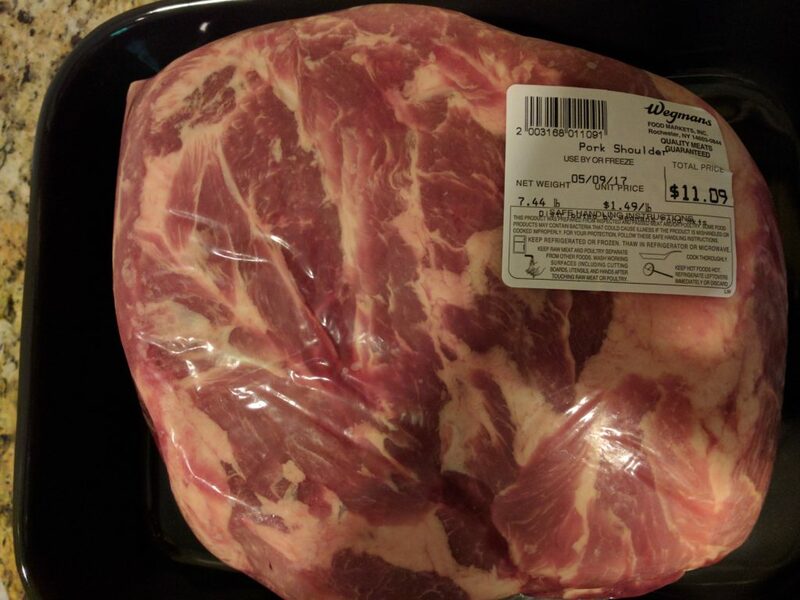 Unfortunately, the price of pork was up $1.49/lb from $0.99/lb this winter. Would it be nice to have twice as much bark? 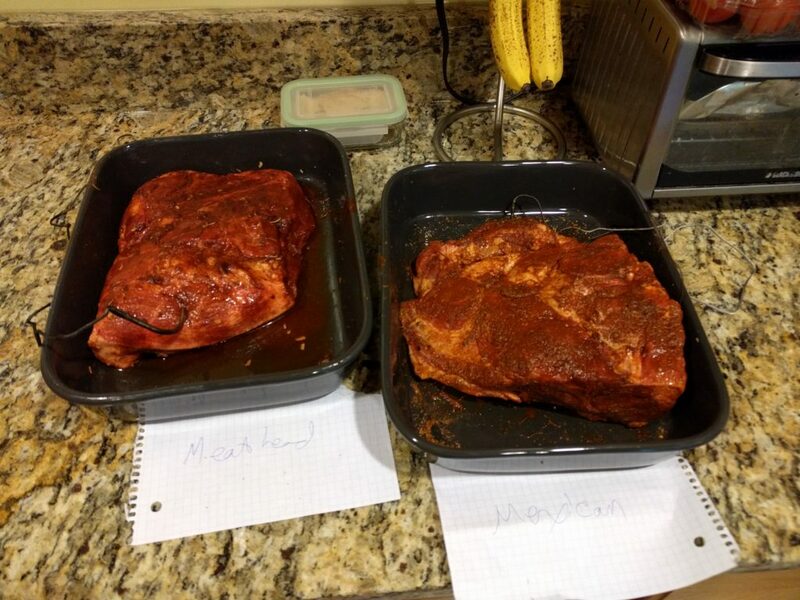 I wanted to try a Mexican-ish rub on one to have pulled pork tacos. 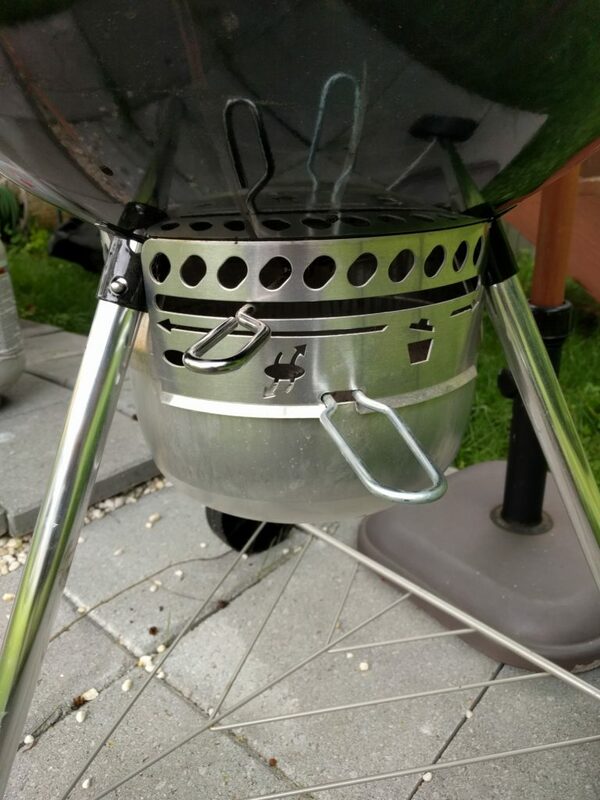 In my opinion, for a long Weber Kettle cook you can’t beat a snake. 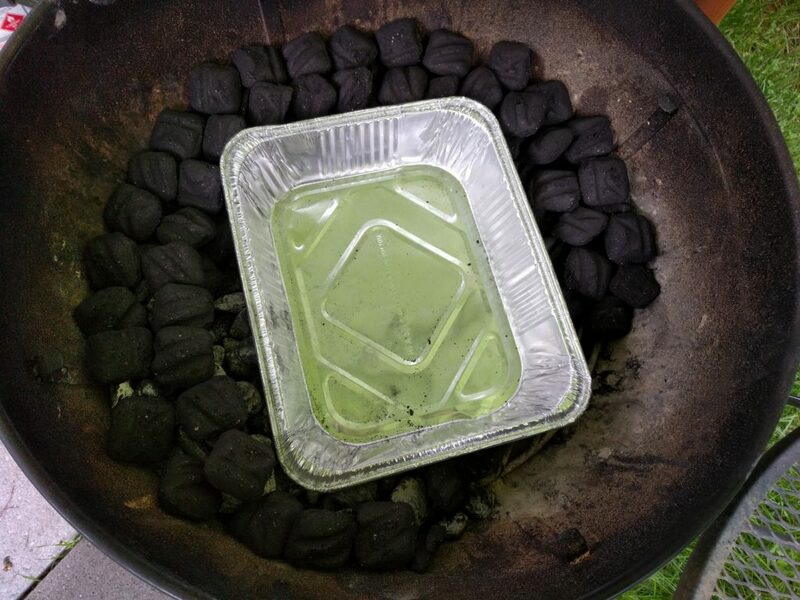 If it’s going to go VERY long, it can be a pain as you have to move the water pan to continue the snake. 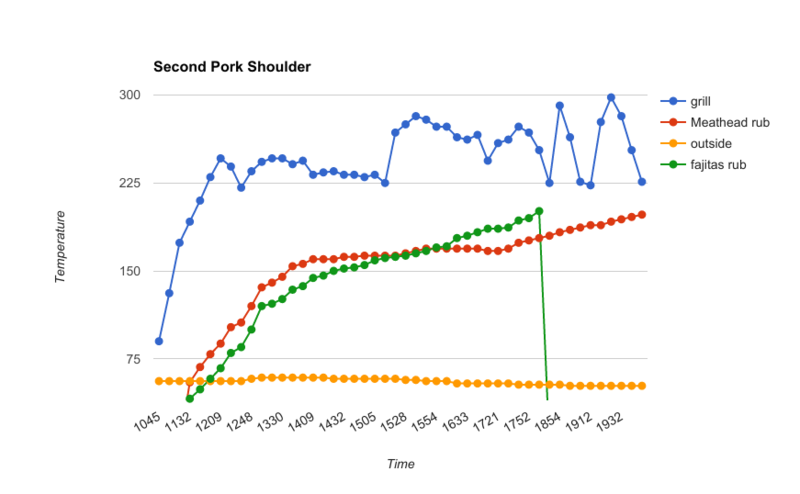 But for medium-long cooks, it’s a nice, perfect way to have a consistent temperature throughout the cook. 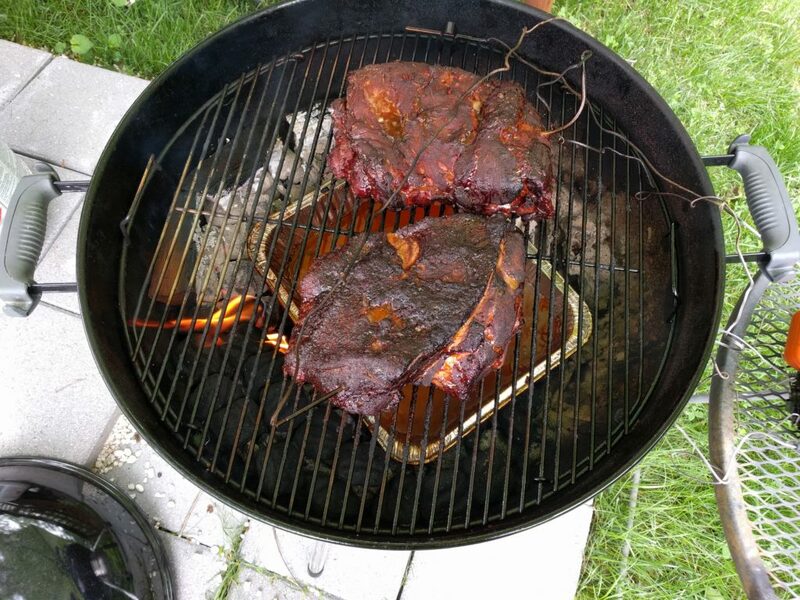 This time around I went with Apple wood chunks to see if I could taste the difference from Hickory. Well, without them side-by-side I couldn’t really tell the difference. 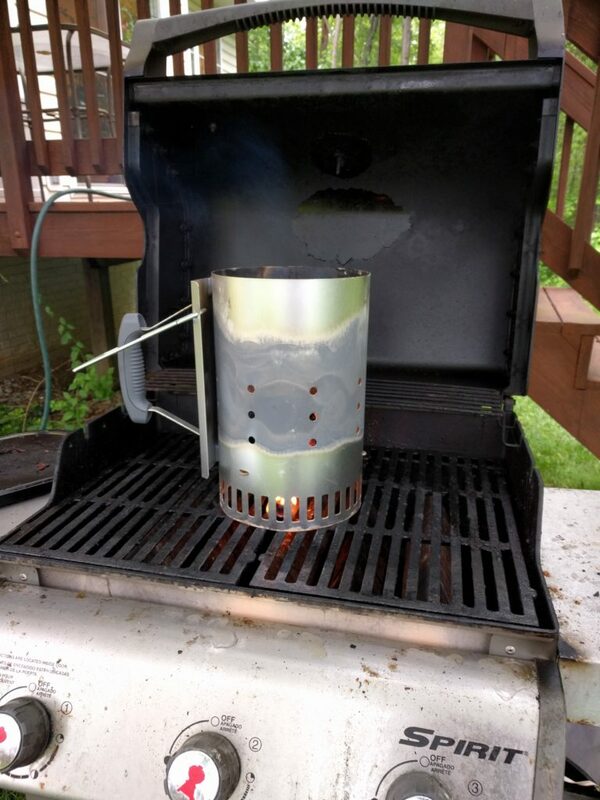 Used the Weber Spirit as a safe place to light the first ten coals. 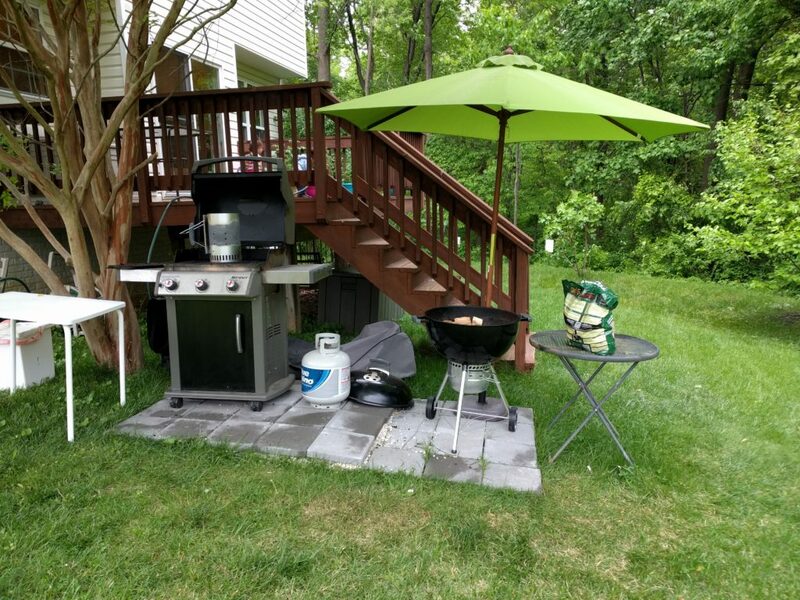 We were expecting rain, so I also setup my umbrella. 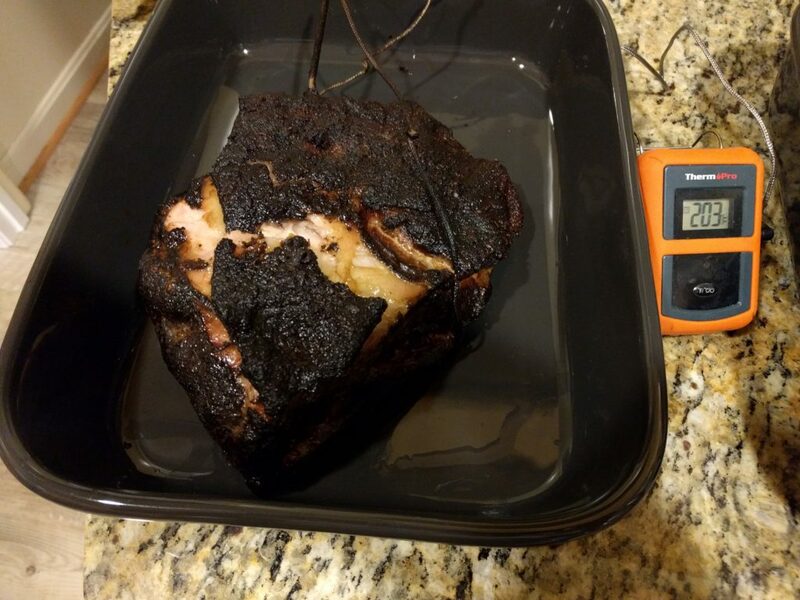 With the fire going, I set about to putting the rub on the pork shoulders while waiting for the kettle to get to 225 F.
It was quite windy and I ended up keeping the lower vents mostly open for most of the smoke. 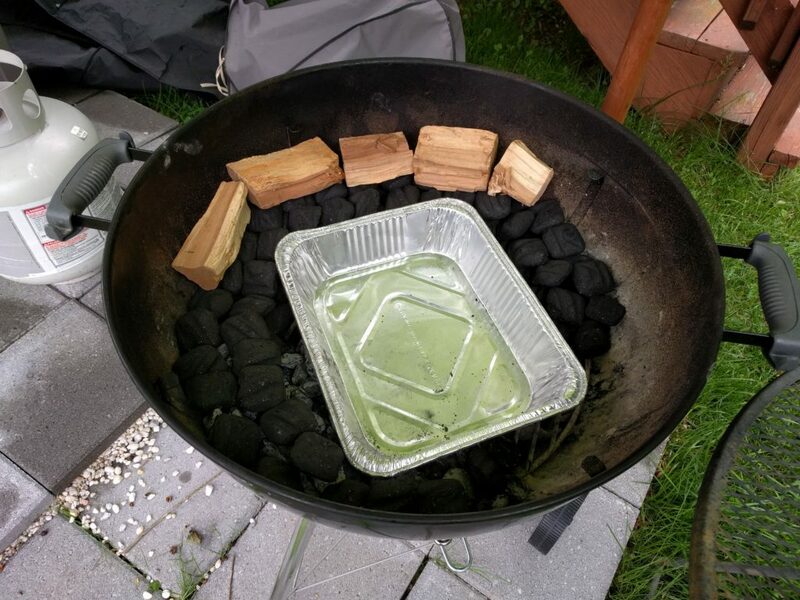 And here’s a shot partway through the cook. 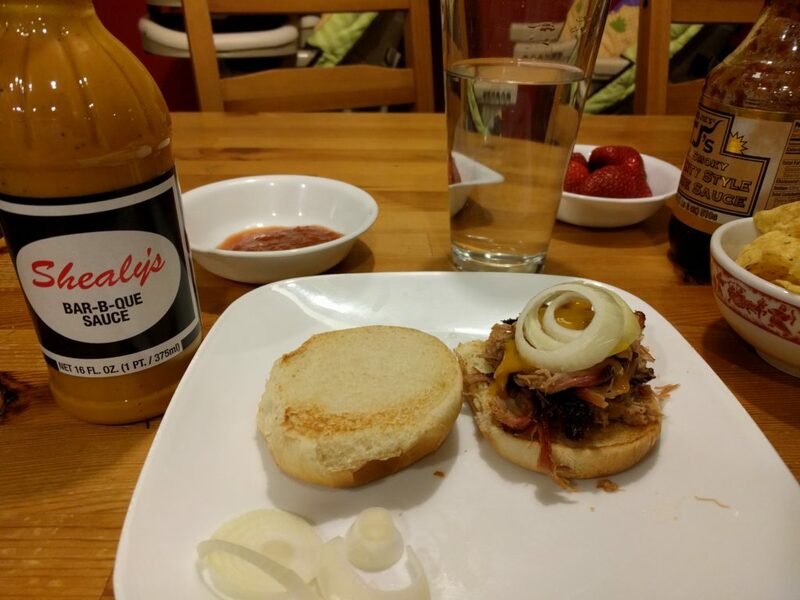 I was reading through Meathead’s sauce page on AmazingRibs.com and saw that Shealy’s was the best South Carolina Mustard BBQ sauce. 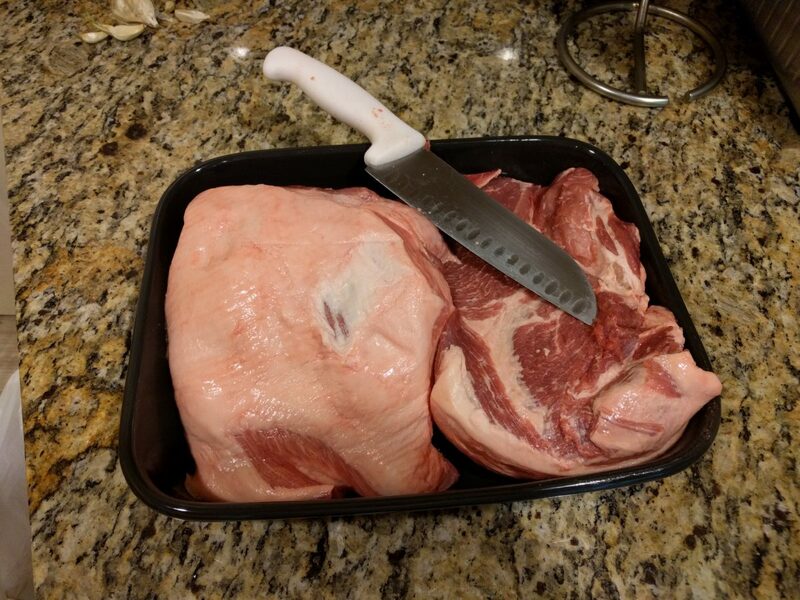 I ordered some from Shealy’s and …. I did not like it. It just tasted like mustard to me. However, as time passed and I tried the sauce with other pork dishes, I came to taste the subtle difference between this sauce (which is mustard, ketchup, and Worcestershire sauce) and regular yellow mustard and I like it quite a bit now. 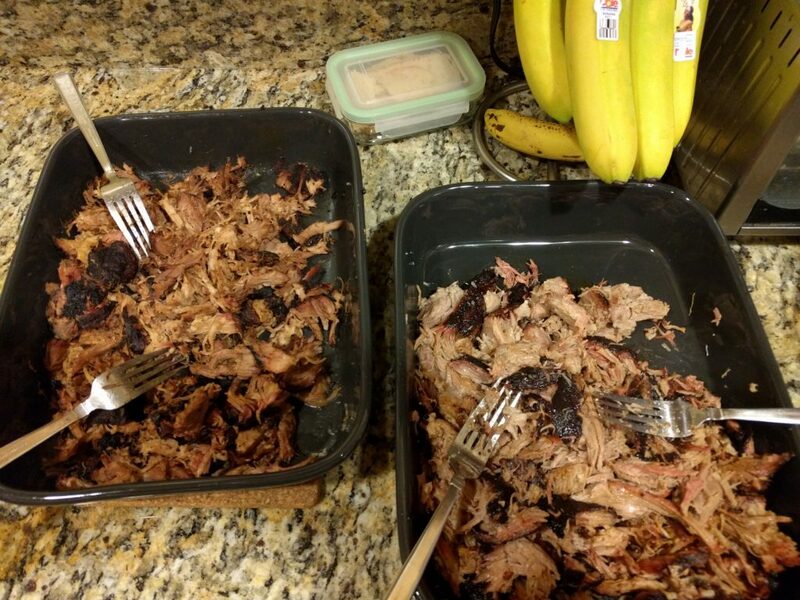 This time the bark was perfect and my wife loved it. Not sure what’s different. 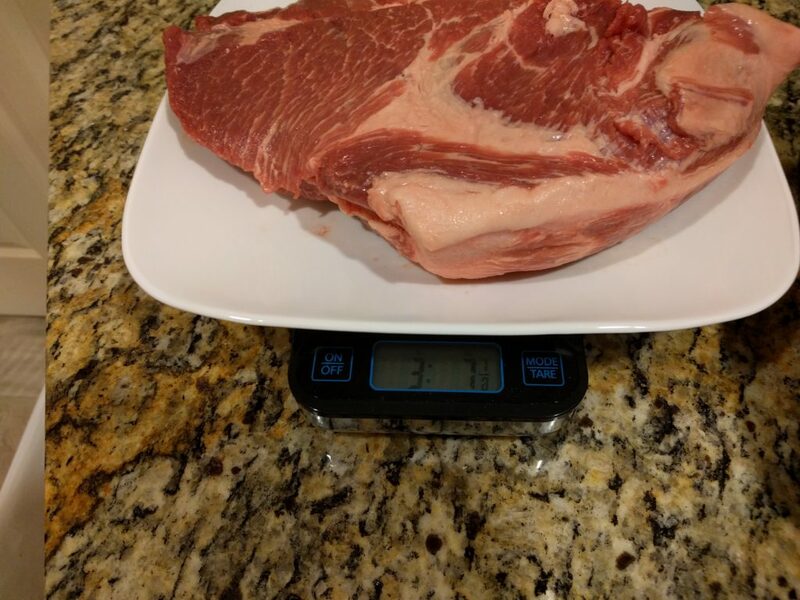 The main difference is that it’s spring now and not winter and Meathead does say that humidity can affect cooks. It’s also possible I overcooked it last time. I’m not 100% sure. 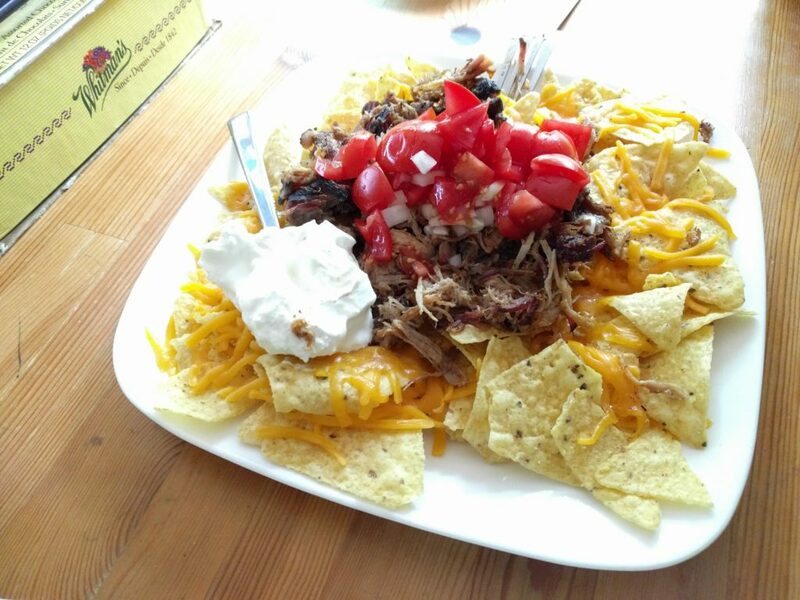 Either way, it was a resounding success and I had fun trying all sorts of different dishes with the pulled pork. 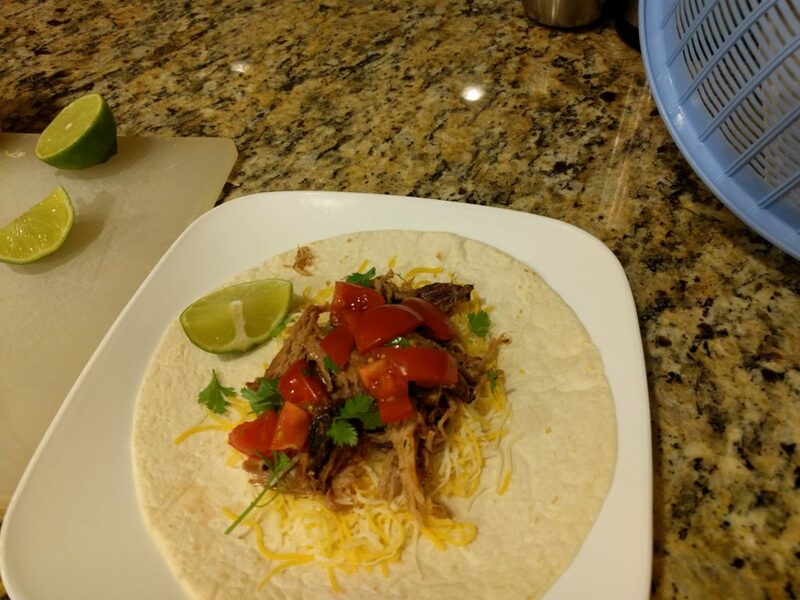 Also pretty awesome (but I didn’t get a photo) was my pulled pork breakfast burrito.